Tratak has been practiced for millennia by yogis and sadhus, and is based on the idea that eyes are the instruments by which the mind and the soul are reached. This article will focus on the external practice, whereby the eyes are fixed on some external object, such as a candle flame though there are many other options. One effect of this is that parts of the brain that are not normally used become active. In this way, tratak can increase our function of perception. But is can also go further than this in that parts of the brain which remain inactive in an ordinary person are awakened. This is how yogis can acquire siddhis, or special powers. In today’s language, they can become superman if you are able to awaken and activate those glands and nerve centres which in most of us are in an inactive state. Tempted? If you need more encouragement, it is also very useful for any eye problems and eye strain. Many of us spend our days staring at screens for work and pleasure, which is a significant source of eye strain. A little practice of tratak great to help strengthen the eyes and also help with actual eye problems. Those who have weak eyesight and wear contacts or glasses should practise tratak for five minutes daily. Ayurveda also advises to wash the eyes with a strained Triphala tea every morning and evening. There are many kinds of external tratak, but a few of the most accessible are listed below (taken from a very helpful Sivananda Yoga article written by Swami Satyananda Saraswati. Candle flame: Light a candle in the darkness and fix your eyes on the flame for five or ten minutes without blinking. Perform this practice in the morning and evening. To gain superpowers you are advised to do this sadhana (spiritual practise) every day. You should continue to look at the flame for as long as you can without blinking. This is especially beneficial for people with any problems with their eyes. Darkness: Sit by yourself in the dark and practise tratak on the darkness. The eyes should be open fully. Continue to see in the darkness without any light. Sit there daily and practise it steadily and firmly. Blue sky: Sit in an open place and gaze at the blue sky without blinking. Try to feel that you have become like the sky or that the sky has come nearer to you. Water: Sit down on a riverbank or raised ground where you can see the current of water for a long distance. Practise trataka on the water. The eyes should remain steadily fixed on one spot; they should not move along the waves. For busy commuters, Changing scenes: While you are travelling in a train, open the window, keep the eyes open and watch distant scenes, without any emotion at all. The eyelids should not flicker, inspite of the changing scenes. The eyeballs should be completely steady and the mind devoid of any feeling. Thus you can also do spiritual practices while travelling. And finally, for nightbirds, practise trataka on the full moon or when the moon rises at night. For this practice, you need to be sitting comfortable, and gaze at a candle flame without blinking. The candle should be placed so that the head can stay balanced on top of the spine, and not have to look downwards. The idea is that the mind is 100% focussed on the candle flame, and becomes merged in this observation. Tratak is a simple practice, but you have to stay alert. If the mind is slightly active, the vision wanders away from the object. Continuous gazing at one object also makes the object appear as if it is two- keep alert for this. At the time of gazing the eyes should not be opened very wide. However, they should not be too droopy either. You may also be overcome by uncontrollable sleep during the practice of tratak. Beginners should not strain their eyes. If gazing is done in a natural state of mind, strain will be avoided. The eyes may water every now and then. This is beneficial and cleansing- just keep going if you can. Breathing must be slow, rhythmic and deep. This will bring steadiness to the body and mind. Trataka can be practices for 5 minutes before you sit to meditate or do yoga, to help focus the mind. The posture needs to be good, so have a good support or sit in a chair, with feet flat on the ground. Swami Satyananda Saraswati summises: “For people of firm determination, the difficulties are surmountable. The practice should be increased gradually and slowly. A concentrated mind is a great help to an aspirant. Everything becomes easy for one who practises with devotion, steadiness and sincerity”. Tratak is linked with the power of healing and clairvoyance. Yogis who have attained this state are able to see things with the eyes open or closed which a normal person is not able to see. Tratak can also be used for spiritual healing, acquiring knowledge of certain events, detection of crimes, acquiring knowledge of the future, tracing lost individuals and so on. Something I’m sure the intelligence services must be interested by (and the subject of a very amusing film called ‘Men who stare at Goats’!) I think I am so drawn to this practice because I loved reading Roald Dahl as a child. 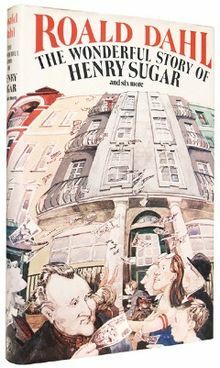 One story that gripped me especially was ‘The Wonderful Story of Henry Sugar’. This is a story about Henry, a wealthy gambler who reads a doctor’s report on a strange patient the doctor met while stationed at a hospital in India. This patient, who called himself ‘The Man Who Sees Without Using His Eyes’, had the ability to see even after the doctors had medically sealed the man’s eyes shut and bandaged his head. The man was part of a circus act and used his ability to make money. When interviewed in more detail by the curious doctors he gave his account. The man claimed he had managed to study with Yogi Fakeirs deep in India, learning some of their meditation methods. The one he finds best is to gaze into a lit candle and watch the flame; the three parts – yellow, red and blue, to close your eyes and keep the image in your mind, and try to envisage a face you know well. It is hard to do this for more than a few seconds, before the mind wanders. However the man persisted and was able to improve the focus of his mind. He develops the ability to see through objects. He tells the English doctors that he was warned not to abuse his powers, and that should he use his ability for selfish ends he would pay the price. The man is unconcerned about this, and is happy to use his ability as part of the circus show. The doctors discuss this, and by morning decide the man could be of great benefit – he could teach blind people to see without their eyes. In excitement they return to the circus, only to find the show cancelled. The Man Who Sees Without Using His Eyes had died in the night. So, why not give it a go with one of the methods listed above. It’s a lovely practice to include in the Winter months when its dark outside, and cosy indoors. By regular practice you will achieve knowledge of yoga through your own experience. Its daily practice will help develop concentration and memory power as well as improve eyesight. As Swami Sivananda always said ‘An ounce of practice is worth a tonne of theory’ and there is nothing higher than self-experience. But be warned! Any benefits you gain from the practice of tratak must be used for the benefit of mankind (think of Henry Sugar).